Untitled (Pen Degradation), 2007, acrylic marker on cotton paper, 39 3/8 x 27 1/2". 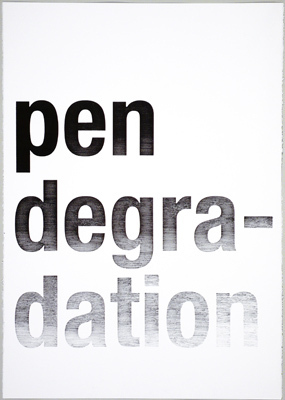 The first works in João Onofre’s debut exhibition at this gallery are a group of drawings that depict phrases ending with the word degradation—for example, BLUE DEGRADATION and RED DEGRADATION, each rendered in its titular color, and PEN DEGRADATION. The works initially appear to be mechanically printed, but on closer inspection they reveal themselves to be made by the same manual process: The artist colors in the letters with pens and markers, the ink of which gradually runs out as the words progress. Following in the legacy of 1960s Conceptual art, Onofre emphasizes idea over form; at the same time, he complicates the former’s primacy by overlapping the conception and production processes and thus bringing together the work of hand and mind. A similar approach is seen in the other work on view, Untitled Version (I See a Darkness), 2007. As the title suggests, the departure point for this video is “I See a Darkness,” the tune composed by Will Oldham but made famous by Johnny Cash. Onofre had two children play the song in a recording studio. Like experienced professionals, the young musicians deliver it with extreme focus, disturbed by neither the studio’s shift in lighting from darkness to brightness nor the powerful lyrics. Onofre has always been attracted to pop music’s relationship to the collective imaginary, and to the idea of cover versions as a form of appropriation. But now, in the age of televised singing contests like American Idol, Onofre steps closer toward a critique of the society of the spectacle, proving he’s not only attuned to artistic traditions but also to the broader cultural field.